By my count, Michigan ran the zone read against Notre Dame three different times and miraculously, despite being forced to hand the ball off for the majority of last year, Denard was able to make the proper read and pull the ball himself. Al Borges accomplished this by reading the Notre Dame linebackers, specifically, Manti Te'o who is, by most accounts, Notre Dame's best defender. Even more impressively, Borges was able to attack Te'o on the zone read from an entirely different formation throughout the game. The second instance, shown here, was the most effective, netting 39 yards, but the shortest of the other option plays went for 13 yards. Michigan comes out in a two tight end set with Mike Shaw in the backfield and Roundtree and Hemingway to Denard's left. Notre Dame is in a standard 4-3 alignment with the strongside linebacker, Prince Shembo, shaded over Roundtree in the slot. 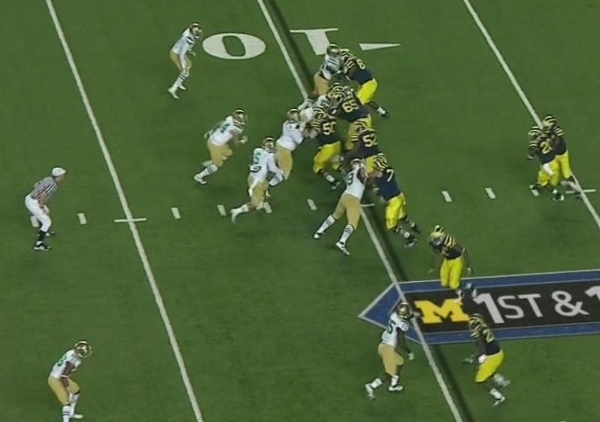 As the ball is snapped, you can see the offensive line beginning to zone block to the right. 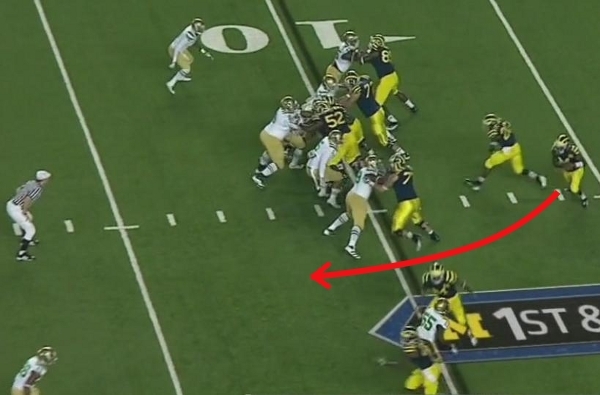 Te'o, who Denard will read, is four yards beyond the line of scrimmage and directly above left guard Ricky Barnum. As the mesh starts, Barnum is sliding right to double the nose tackle and Te'o steps up to attack the strongside B gap that was vacated by Barnum. Denard will read whether or not Te'o attacks that hole or if he stays home. 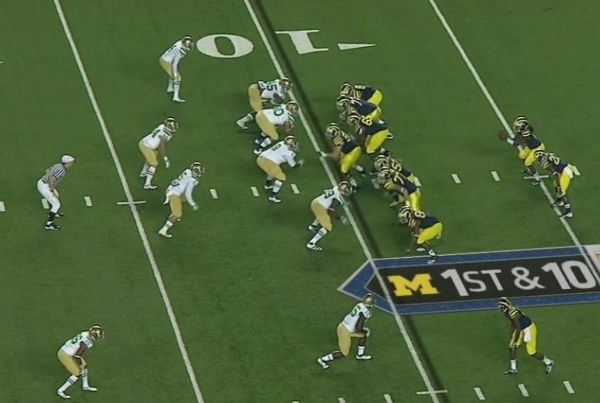 Denard and Shaw are still engaged at the mesh point right now, and Te'o is committing to the handoff. By the time Te'o realizes that Shaw doesn't have the ball, he's already been sucked into the offensive line. Koger was lined up as the strongside tight end and has leaked out to kick block Notre Dame's strongside linebacker. Roundtree is releasing from his slot receiver position to head upfield and block the Notre Dame safety at the top of the screen. 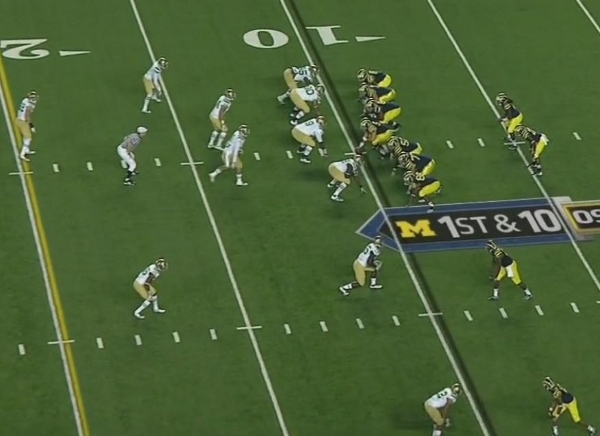 This play would go for 39 yards and stand as Denard's longest run of the day. Fundamentally, there's nothing spectacular about this play; it's a simple zone read. What Borges did here, however, was isolate Notre Dame's best defender and force him to make a decision and, more importantly, take himself out of the play. What's brilliant about this play is that a linebacker won't be able to recognize whether or not he's being "blocked", so he will naturally attack what his eyes see. In this instance, he saw an offensive line that was zone blocking right, no unblocked defensive ends, and a mesh point between Denard and Shaw. This looked like a simple sweep play, but it was actually an option. 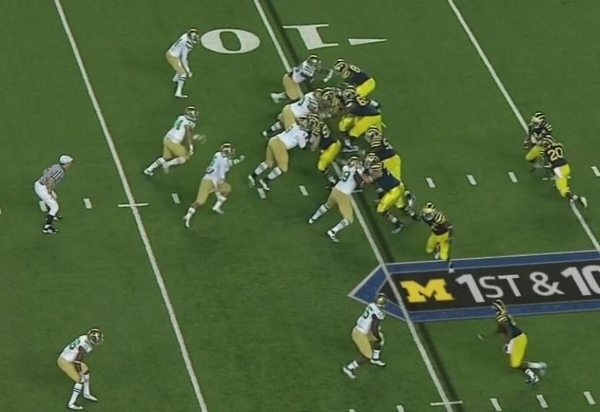 This baited Te'o into committing to the Shaw handoff and left the weakside of the play wide open.